Which parties were most read on Wikipedia? | Can social data be used to predict elections? 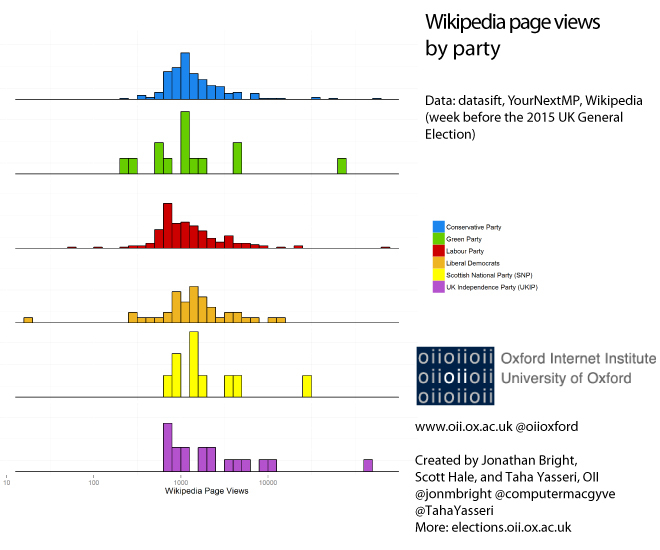 Which parties were most read on Wikipedia? Taha and Stefano previously looked at the distribution of Wikipedia pages by candidate. These pages are much more patchy than Twitter handles: only in the Conservative and Labour cases do more than 40% of candidates have an account, whilst most other parties have far less (though we should note that we are relying on the data crowdsourced by YourNextMP, which is brilliant but not guaranteed to be perfectly accurate). This could be a mistake: the 520 candidates who did have a Wikipedia page together garnered 1.6 million views in the week before the election. Could the candidates who didn’t make have missed a trick? Again, the party leaders account for a lot of the traffic: David Cameron and Ed Miliband contribute around 400,000 of those views alone. But many other pages attracted several thousand views, which in the context of a closely contested election in constituencies of around 70,000 in size, could be quite significant. The distributions of page views by party are shown below. 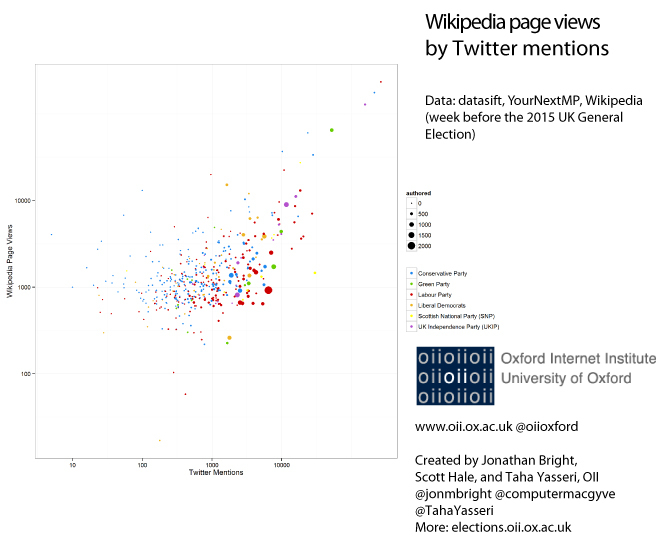 How do Wikipedia views compare to activity on Twitter? They are uncannily similar: they are highly correlated, and at around the same levels: on average, candidates which got 1,000 Twitter mentions got 1,000 Wikipedia views. Perhaps a surprise – considering the very different mechanisms which generate the data. This entry was posted in Data, GE2015, Wikipedia and tagged campaigns, data, oii, wikipedia on May 12, 2015 by jonathanbright.